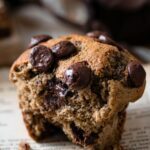 Moist and delicious Banana Muffins made with Roasted Plum Puree, Ripe Bananas, and Chocolate Morsels for a delcious breafkast or dessert muffin! Preheat Oven to 375 F (190 C). Place 6 large or 12 small muffin wrappers in muffin tray. Using a separate bowl hand whisk together flour, salt, cinnamon, baking soda, and baking powder. Remove bowl from mixer and fold half of the chocolate morsels into the batter. Top each muffin with extra chocolate morsels. Bake for 15-18 minutes and golden brown or until toothpick in center comes out clean. Place muffin tray on cooling rack for 5 minutes. Remove muffins from tray and eat warm!